• PLOT SUMMARY: "Messiah War" Pt. 5 of 7. -FORCE/CABLE: MESSIAH WAR'-The War heats up! As Stryfe gets even closer to learning the secret of Hope Summers, Bishop has no choice but to make his move. X-Force has split into two strike teams... but only betrayal and death await them. And the choice Archangel makes will change everything. 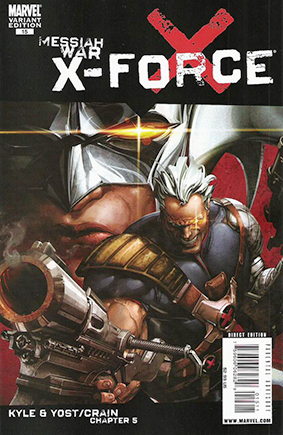 Plus, the battle a millennia in the making... CABLE vs. STRYFE. Written by CRAIG KYLE & CHRISTOPHER YOST. Pencils by CLAYTON CRAIN 'X. Variant Cover art by Kaare Andrews.